Shirts With Random Triangles: Jimbo Fisher: Jacob Coker better than former Alabama QB's Greg McElroy and A.J. McCarron? Jimbo Fisher: Jacob Coker better than former Alabama QB's Greg McElroy and A.J. McCarron? 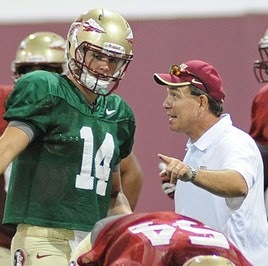 Jacob Coker and Jimbo Fisher. Via TideSports.com. Jimbo Fisher just opened up a hornet's nest. The Florida State Seminoles coach was singing the praises of former Seminole quarterback Jacob Coker, who transferred to Alabama following graduation. In doing so, Fisher decided to drop a mega-zinger in comparing Coker to his predecessor QB's under Alabama Crimson Tide coach Nick Saban. "Including what they've had, he's much more talented than anything they've had," he told TideSports.com. "I don't mean to discredit the previous guys, they were all great. But this guy is extremely talented. Arm and mind. He's a backup because he's behind the best quarterback in America. (Coker) may have been one of the top three or four quarterbacks in America physically." So Coker better than John Parker Wilson, Greg McElroy and A.J. McCarron? Fisher is probably correct about John Parker Wilson, by McElroy and McCarron? Two QB's who helped lead 'Bama to three BCS titles in four years? It's going to be hard to say who's better between the three at the moment, since McElroy and McCarron's records speak for themselves, and Coker hasn't thrown a pass yet at 'Bama. That's a strong statement that Coker's gonna have to wear around his neck like an albatross this season. Despite what's seen as a weak schedule, Alabama is gonna have a couple of roadblocks in its road to the SEC championship game and the BCS title (LSU and Auburn for sure).